Home Domestic Football Transfers: Is Neymar Staying In PSG? Football Transfers: Is Neymar Staying In PSG? 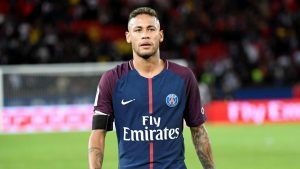 The Brazilian winger, Neymar has been repeatedly linked with a move to Real Madrid since he was transferred last summer to Paris Saint-Germain. However, the Los Blancos have clarified there is no chance they will sign Neymar. The rumours escalated a few days ago when Real Madrid’s star player, Cristiano Ronaldo agreed on a 105 million euro fee to join Juventus. However, according to the reports, PSG has offered Neymar a new contract to keep him there. Moreover, the club is also ready to increase his yearly salary (37 million euro) so that he could move closer to Lionel Messi’s salary (50 million euro). The Brazilian has also reportedly said that he will continue to play football in Paris. He concluded his statement by saying that he came to this club for challenges and objectives and hopes that his next season here would be a successful one. Also, the Paris Saint-Germain striker has no release clause and it is asserted that Real Madrid want to force along a move in a transfer bid.